The approximately 340 species can only be found in the Americas. They range from southeastern Alaska and western Canada through the United States and Central America (including the Caribbean islands) down to Tierra del Fuego at the southernmost point of South America. 290 species are native to the South American countries of Colombia and Ecuador. 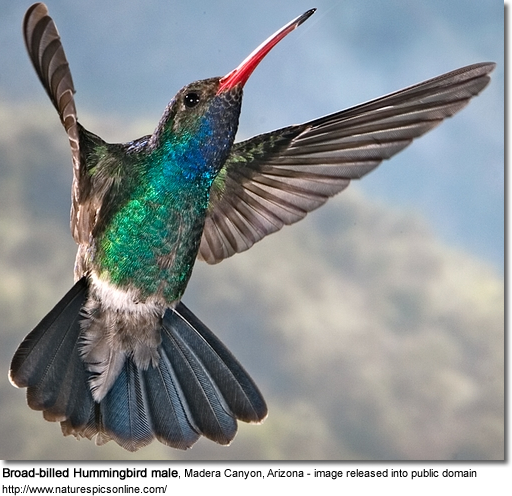 In Ecuador alone, 163 hummingbird species are found -- it has more hummingbird species than any other country. Over 50 species are native to Mexico. 23 species are found in North America, mostly west of the Rocky Mountains and south of the Mexican-American border. Eastern United States: The Ruby-throated Hummingbird is the exception as it is native to the eastern United States, specifically it occurs from Maine south to Florida, to just west of the Mississippi River. Western United States: The Black-chinned is the most widespread and common species in the western United States. Alaska and Canada: The Rufous Hummingbird nests the farthest north, into Alaska and western Canada, needing to survive below-freezing temperatures. It is the most common hummingbird species in Canada. Most of those species that breed in the United States and Canada migrate south in fall to spend the winter in northern Mexico or Central America. Some southern South American species migrate north to winter in the tropics. A few species are year-round residents in the warmer coastal and interior desert regions; for example the Anna's found in the southern California inland ranging to southern Arizona and north to southwestern British Columbia (the western most of Canada's provinces). They have also been reported to be quite common on Bali - an Indonesian island. Nobody really knows how they got there, but they have been resident on this island for several decades. 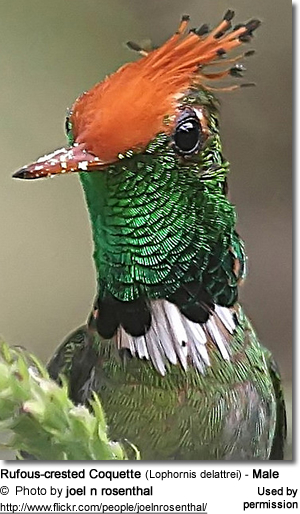 They are mainly metallic glossy green and look similar to the Steely-vented Hummingbird, except it seems to be a little smaller than its Central American cousin. In the Balinese language, these hummingbirds are commonly known as "cit jlanting" - "Cit" referring to its "cit cit cit" calls and "Jlanting" referring to the fact that this bird is always hanging on the flower. Reported by Jean Redman who lived in Bali for several years). It is possible that this is an unidentified sunbird instead, or that these are true hummingbirds that were once introduced to the island. There are some discussions about what causes these tiny birds to migrate. Most agree that the urge to travel long distances to and from their breeding territories is brought on by hormonal changes triggered by changing environmental conditions, such as shorter or longer days, environmental temperatures, and availability of food. For example, at the end of the flowering season, most species found in Canada and the United States migrate south to Mexico and Central America. The migrating birds travel huge distances, averaging 20 to 25 miles (30 - 40 km) per day, stopping only to eat and rest. Many Ruby-throated Hummingbirds travel 2,000 miles (3,200 km) to go from Panama to their destination in Canada or vice versa, which involves an amazing 500 mile (800 km) non-stop flight across the Gulf of Mexico. Increasing numbers of formerly migratory species are now remaining in their breeding territory -- particularly, if the climate is generally moderate and food is available year-round. Some even survive northern winters and return to the same gardens year after year - due in part to hummingbird feeders and winter-blooming gardens. The Rufous Hummingbird breeds further north than any other hummingbird species and they have to tolerate temperatures below freezing. This is possible if adequate shelter and hummingbird feeders are available. Some are changing their migratory routes from wintering in tropical Mexico to traveling within the United States instead. 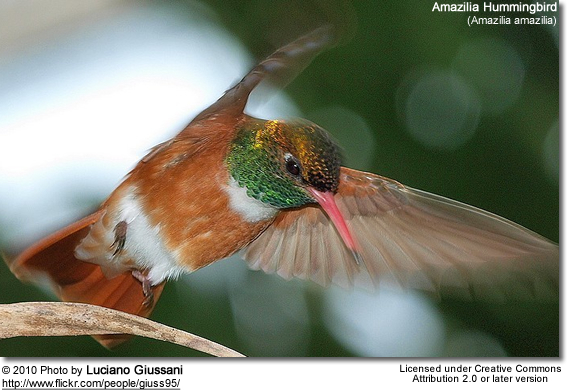 For example, the Rufous Hummingbirds breed in western North America and are wintering in increasing numbers in the southeastern United States. Male usually migrate up to three weeks earlier than the females. One assumes that the males are doing so because they want to have their choice of the best territories, which improves their chances of attracting females for mating. 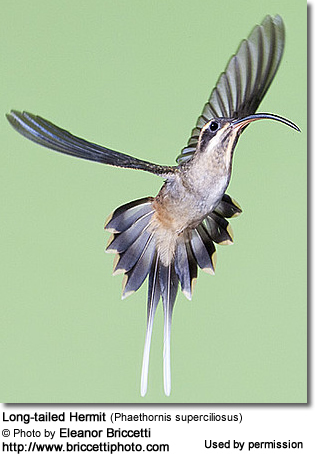 Hummingbirds migrate on the backs of geese or other larger birds. Geese fly on different migration paths or fly-zones than hummingbirds do. This myth may have been started by John J. Audubon who shot a goose and when turning it over, a hummingbird reportedly flew out. However, there is no evidence to support the theory that the hummingbird actually "hitched a ride" with the goose. Keeping feeders out too long will stop them from migrating to their wintering grounds. Please refer to this webpage for information on this topic. The majority of hummingbird species occur naturally in the tropical and sub-tropical regions of Central and South America; some species also occur in temperate climates. A few survive in the colder climates of Alaska and Canada. Hummingbirds are found in a variety of different habitats, including grassland, wooded and forested areas, as well as desert environments. They also occur at a range of altitudes, up to 14,000 feet (4,300 m) in the South American Andes Mountains.